"So, wacha bin doin AC? Yiz haven't bin hangin rown here much?" Well, since you ask so nicely, I confess to being pretty busy AC: creating a photo album of Zach's first year. I had made one for his sister, and it was time to come up with the goods for the boy, and as it was his birthday [party] on the weekend, the time crunch was on. Three years ago, when Nikki Dee happened into my life, I pretty much put her album together as her first year unfolded. She was the first grand after all and everything was new and fresh. I was in love with her, and she didn't haven't an older sibling to distract me and demand my time, so it got done. With Zach, it was different. With his sister requiring much energy, I never quite managed to get around to making the album as the year progressed — at least that's my official excuse. But I always planned to present one on his first birthday, and as the day drew nigh, I began to get busy. 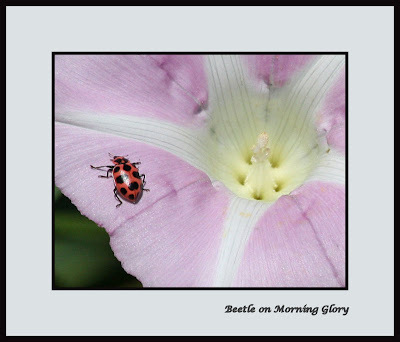 Here are a few samples of what I have put together with the slideshow of the whole album below, including a link to the larger view directly on Flickr. Finally, this is the last page in the album: month 12. When lightning strikes, I may add a page or two for the party. Meanwhile, if your are family (or just curious) and want to see more, see the slideshow of the whole album is below, including a link to the large version. Click here to view the slideshow larger. About three quarters of an hour before we get to the cottage where we turn the car north from highway 7 to 62, there is a Tim Hortons. After several hours of driving it's a welcome stop, which we always visit both going and coming. 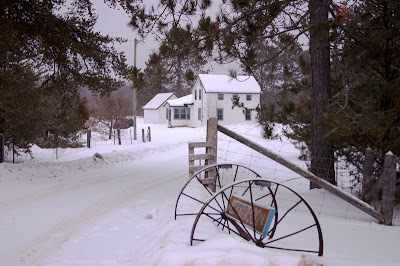 This time, as we pulled in on the way to the cottage, we were amazed to find very few people there, for despite the fact that it is located in a pretty rural area, there is much driveby traffic that feels compelled to stop, and it's always busy. There was no lineup as we entered and headed into the restrooms. I was stunned to emerge to a large crowd of high school kids who were on their lunch break. Obviously, there is a high school in the nearby village, and I asked, stupidly asked, the girl behind me how long it took to walk from the the school to the coffee shop. "About ten minutes," came the reply, "but I drive because I take the car to school." Silly me, of course she does. What I again heard from the kids as they made their orders was the word BAGel. Over and over, a kids would order a BAGel, not a BAYgel. It seems that every kid of every generation automatically does this. Do they never hear adults saying the words correctly? Also, as far as I understand the rules of pronunciation, the a should be long, as in bay, so they should get it right regardless. But, no: they forever insist that it's a BAGel. And I continue to scratch my head. 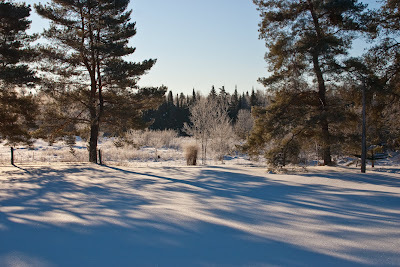 Before I move on completely from our little winter vacation, I want to post a few more cottage photos. It seems appropriate to show winter photos as we head back into colder temperatures in this area after experiencing some fairly mild ones in the past two weeks. Just the other day, I was almost basking as I waked through a parking lot with my coat unzipped with the sun making an appearance of sorts. 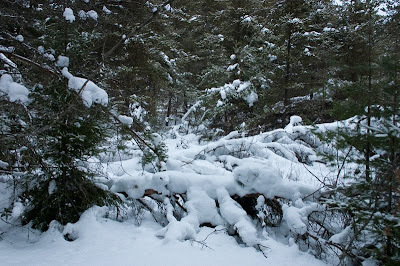 We found quite a few fallen trees this time, particularly on the less trodden pathways which probably haven't been cleared in the past few years. 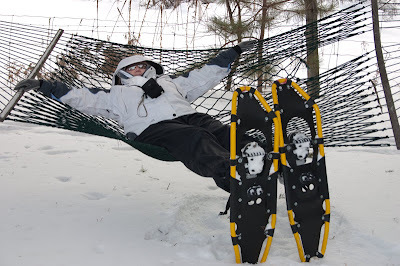 Although snowshoeing can be quite exerting it can also be a lot of fun. Here Cuppa turns to bless me with her happy countenance. 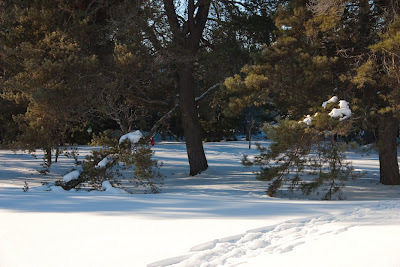 It's amazing how one can find comfort in the great outdoors even in winter regalia. The cat-like Cuppa is a master of creature comforts. 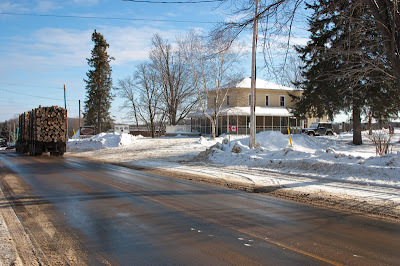 One day, I found myself in the nearby hamlet shopping for provender and stopped to take a picture of the restaurant that we had visited while waiting for the cottage to thaw out. Also, a few days before, my BIL and I had cause to drive past, and there must have been two dozen snowmobiles parked outside. Seriously, the upper parking area was overflowing to the point that many of the machines were forced to park by the road. Sadly, I didn't have my camera at the time, but I did this time and had just taken a picture when the logging truck went by. I thought how Canadiana it was, and if the snowmobiles weren't going to come out to play on a work day, I could at least get something authentic. I managed to squeeze the trigger just before the truck roared out of sight. 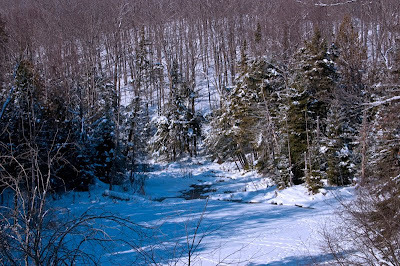 On the way back to the cottage, I stopped the car by a little valley and took these pictures. While I'm not totally happy with them, they do show you more of the local geography: snow, trees, and water. Being Home: we've been home from the cottage for a week now, and I notice that I've only posted once. What's up with that? Getting away is good, but life is all about living well where you are most of the time. So, there was joy in our return. Birthday Boy: although the actual day is still a week away, guess who will be having his first birthday party this weekend? No silly, it's the little guy on the left. Growing: Nikki Dee has been able to say all her letters for a long time now and to direct them to the right spot on the board. Fitting them in used to be a problem. Not so now — easy peasy. 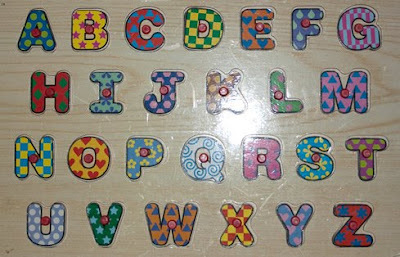 I try hold letters upside down to fool her but she calls them correctly regardless and puts them directly in their places. Blogging: in the past I have sometimes mentioned Doris, particularly with regard to her photos. Well, she recently began her own blog. She's a working girl, so I don't expect her to be an everyday blogger, but she now has more than a half dozen postings to her credit, so I invite you to drop in to Thoughts and things and say hello. Doris and I were friends as kids and haven't seen each other in more than forty years but we're still friends. Her two most recent posts are about honesty and it's costs (sort of). To entice you, here's one of her photos. 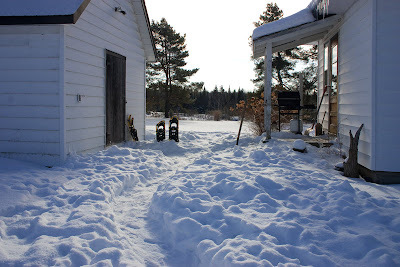 I posted a rather lengthy and tedious, narrated tour of the cottage after a visit last March, and I'm sure that no one, including me, could manage to sit through a sort of repeat, so I'll just share a few photos with short notes, this time around. Both then and now, however, I begin at the gate looking toward the house. I must take this picture on every visit in every season, and that is pretty well true for the rest of the photos too. 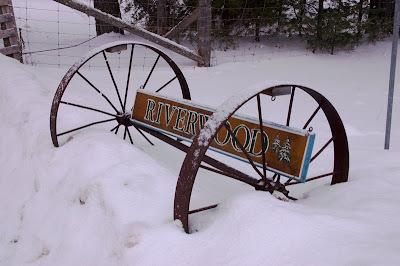 A plough has knocked the sign somewhat askew this winter, but you can see that the place has been named, Riverwood, which is certainly appropriate as a river forms the eastern boundary, and there are acres of woods throughout. 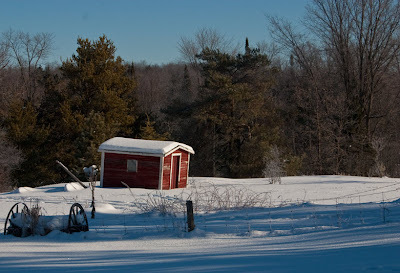 Looking southward: on a typical winter day, we'll stack our snowshoes in the space between the house and the shed. The remainder of the photos are more or less taken from that same space. I turn from facing southward to northward, and see a gate beyond which a slope leads up to the woods. Our quaint snowshoe tracks lead off in that direction although they really represent out reutrn route in our treks of this last visit. The snow was falling when I took the next photo just to the right of the one above. It's the garage/workshop. To the right of the (almost looking east now) is a little shed that isn't really used for anything but always waits patiently and contentedly to lure the next amateur photographer into its picturesque snare. In this case it catches the low morning light. The next photo looks southward from behind the house, across the backyard, toward the field that was possibly ploughed or at least grazed a few times in days of yore. There has been frost in the trees that morning, and there is still some remaining on the little trees in the middle of the photo (which you might see if you click through to the larger version). Panning a little right from the above photo in a more southwesterly direction we see some of the backyard, including a red humming bird feeder, which, for some strange reason, was not attracting too many hummers last week. Maybe I'll post another set further from the homestead in the next few days. 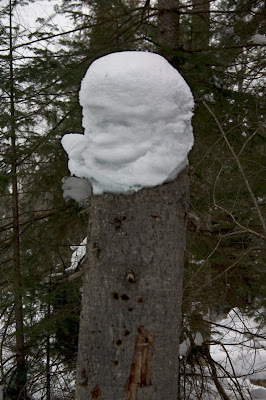 Here are a few pictures from our snowshoe tromps through the woods. I expect I will be posting more in the next few days. I see faces in a lot of places. Sometimes others see them just as easily as is probably true for the photo above as well as the one directly below. 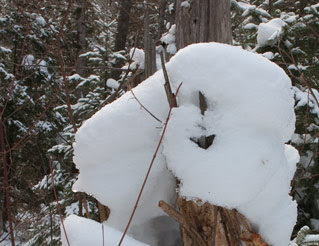 In both cases snow has accumulated on stumps, and the face is in the snow itself. But I'm not sure if this next one would be as apparent to some as it is to me. 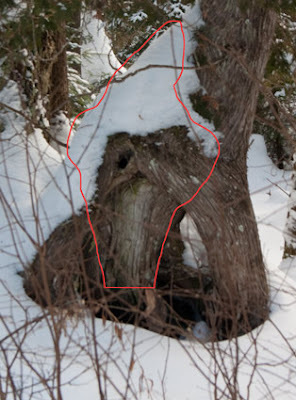 I've outlined a sort of gnomish face in red. The snow is the hat and the lower part the beard. I think you can work it out from there. Would you have seen it if I hadn't pointed it out, or are you more blessedly normal? We're home! 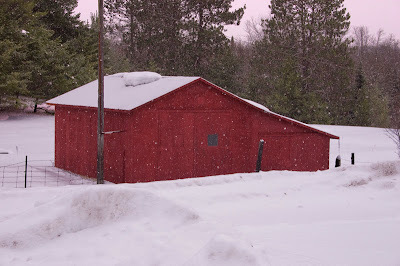 You may recall that the first post from the cottage was supposed to have a photo included. It didn't, but when I got home, I checked Google's Photos (or Picasa Web Albums), and sure enough, it was there. I know that some of you have recently experienced difficulty in posting photos, but when you upload to Blogger, they also get stored in an album. They may still be there if you check. From the album, you can grab the code and embed it back into a blog post. Which is what I have just done. It shows Cuppa and her sister warming by the stove while the furnace was valiantly trying to bring the cottage back up to a habitable temperature. It was fun. Really. But it's good to be home. Since I know that the previous email post worked, here's another little postcard from the cottage before we return to the land of telly and internet sometime tomorrow. I also know that the subject line of the email will become the title that Blogger uses, so here's my mystery. I want to know why the same rigorously controlled temperature can seem wonderfully warm and comfy sometimes and so cold at others. We have been keeping the thermostat steady for the past few days, and for the most part I have been quite comfy womfy, but right now my hands are dreadfully cold, and I am almost shivering under my multiple layers of clothing. So, that's the mystery to which I will expect there will be a perfectly lucid explanation, perhaps several, from my brainy and distinguished colleagues in blognotdumb. I said that I would experiment with emailing a post, and since I like to think of myself as a man of my word, here I be. There's a whole different pace (or lack of same) to cottage life, let me tell ya. Aside from email, I am pretty well without internet (which I prefer not to capitalize -- I mean to say it's not truly a proper place like Belgium or Botswana). So, I am reading more, to the point of beginning a book last evening and finishing it around noon today. When Cuppa and I browsed the local library prior to this little hiatus, my eyes happened to spy a new (for me) British mystery writer: Simon Brett, whom I found quite palatable if not as gripping as Peter Robinson or Elizabeth George, for example. In point of fact, I can't recall the last piece of fiction that I read. I did give Dan Brown's latest the old college try but wasn't exactly rivetted. Actually, I put it down before Christmas and forgot that I had been reading it. However, I dusted it off for this vacation, cracked it open, and found that it was more interesting as I neared the climax. Interesting, but too macabre for my taste as having a guy locked in a box being slowly filled with water isn't my idea of pleasant reading. So, I gave it up for good and turned to Brett who unfolded an interesting but sedate whodunit sans frantic chase scenes (although I have to admit that someone did get shut up in a fairly tight space -- thankfully, just not quite that tight!). 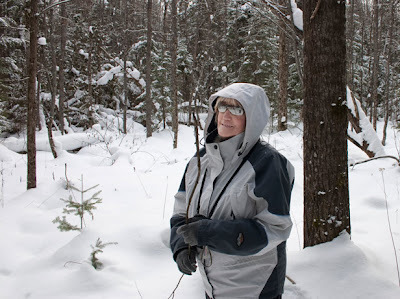 We'll soon head out for another snowshoe trek through the woods. 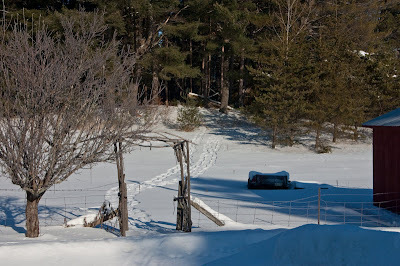 Although there has been recent melting, there is still about a foot of snow in the woods, so the shoeing is pretty good. There even remains snow on some branches from past falls, which is pleasant to the eyes. Also, we have had some pretty flurries today, which have ceased for the moment. 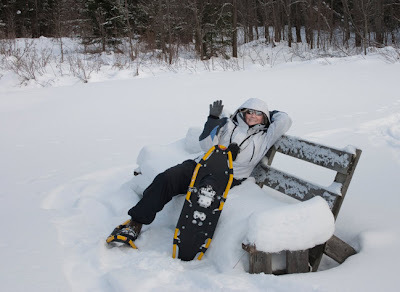 Although temperatures haven't been frigid (hovering around freezing), you'd think it would be cold enough not to sweat too very much whilst on a snowshoeing excursion ... but you'd be wrong. 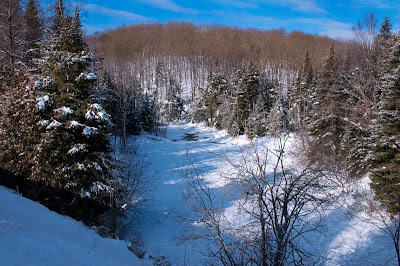 We both returned drenched yesterday, and I've concluded that if one could and would snowshoe for an hour per day, one would soon become relatively fit. Hmmm ... maybe I should spend the rest of the winter here. Now, let's see if this posts. We’re at the cottage shortly after noon on Monday. We arrived at about this time on Friday to a disaster … or what could have been a disaster. Inside was colder than outside and everything was frozen, by which I mean the taps and the toilet, and by toilet, I mean that the water was frozen solid, both in the bowl and the tank. And … the furnace wouldn’t fire-up, which, of course, was why the place was ice-locked in the first place. Having no clue as to what to do, and it not being our place, we drove to the nearby small village where there is quite a decent little restaurant and waited for the owners to arrive. They found that there was oil in the drum and that the furnace simply needed resetting. 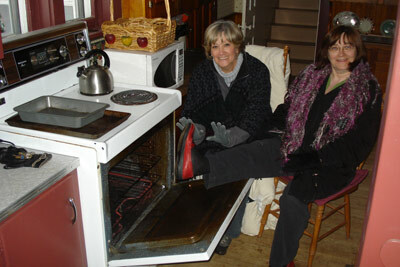 Meanwhile, we gathered around the cooker to try to get warm as the thermostat began the climb. It soon reached the freezing point and within about two hours was up to 50F/10C. SIL found a hair dryer and used it to hasten the thawing of the toilet, and by about 10 PM, it had worked: mercifully, as relieving oneself in a local snowbank is not the most desirable accommodation – particularly for the ladies and for anyone in the middle of the night (such as unowho) for that matter. Somewhat miraculously, there were no burst pipes or taps, and all has been well ever since. Meanwhile, forgive me for not reading your blogs for another few days; the connection is simply too problematic. Since my loved ones frequently enjoy a good laugh at my expense, I might as well toss a snicker-worthy tidbit your way. I told you that we went to visit Lorna and Dave on the weekend, and I told you that it was cold out, but that we still bundled up and went for a walk. I think I even told you that I wore long johns. What I didn't tell you is that I left them (the lj's) behind. I can try to tell you that it was an act of kindness to help keep Dave or Lorna warm, but they have their own warmer-thingies, and probably only want to handle mine while wearing those hand-c0nd0m-latex-thingies. I didn't tell you this in the previous post. I didn't tell you because I didn't know. But after I received a very funny ransom note from Lorna, I did know. Apparently, Lorna has joined the throngs who enjoy a chuckle over AC's absentmindedness. Of course, my kin were kind enough to remind me of the time that I left a goodly number of apparel-ish items at a hotel after a conference. There was a suit, which I sort of remembered when they brought it up, but they also claimed that there was underwear and socks and such. The suit had been left hanging in the cupboard, but Cuppa says that the other items were found on the floor behind a chair. But you know, I cannot be held totally responsible for that particular breakdown. It all began when four male teachers were booked into one hotel room with two beds. Pity AC, who could picture himself hugging his bedmate (so to speak) in his sleep, and therefore decided that his best bet was to sleep on the floor. Fortunately, he manage that because he was still young of body as this happened quite a long time ago. Come the next night, another room was made available when several speakers who had finished their presentations went home early. Of course, this only happened at bedtime, so I grabbed what things I could think of and scurried off to my new digs. Of course, I never thought to go back to the old room and looking around before checking out the next day. I really think that under the circumstances such a tiny oversight is quite understandable. So, really: leaving my underwear behind only twice in more than six decades really isn't so bad. Please tell me that you agree. PS: We'll soon be off to cottage country and abysmal internet service for a few days. I would be surprised if I am able to post or even read your posts for awhile. On a fine frosty Friday we were visiting blogger Lorna and Dave. They live cheek-by-jowl with downtown Ottawa and Parliament Hill. Actually it wasn't Friday, but Saturday isn't alliterative with fine and frosty. Although temperatures were near the Fahrenheit zero and were aided and abetted by a cold wind, these four seemingly silly Canuckleheads decided that it was a perfect day for a walk. 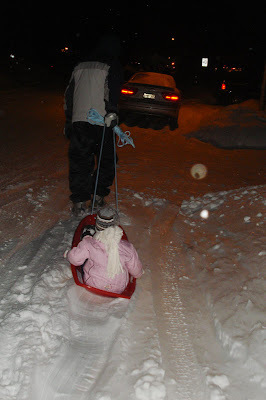 In point of fact, it was nearly perfect because we were all so bundled that we felt no pain. 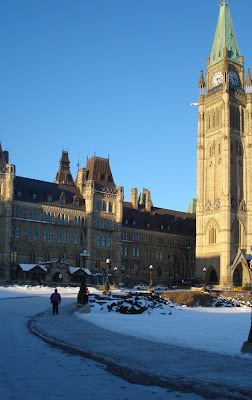 We decided that since we were in the neighbourhood, we should see if we could go inside the Parliament buildings and ascend the Peace Tower. 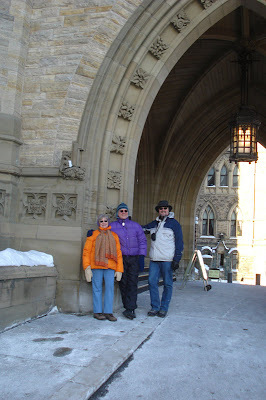 The photo (below) shows the tower the other three walking toward it. Actually it only shows two as Cuppa was mostly behind the tree. At the door (more or less), Cuppa snapped me with the fluorescent couple. 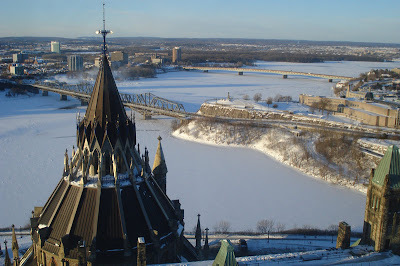 I was sceptical that one could just walk up to the centre of government on a whim on a cold Saturday and request admission, but after a quick security scan we were on our way up the elevator to the Peace Tower lookout. I think that's pretty neat. O Canada, eh? 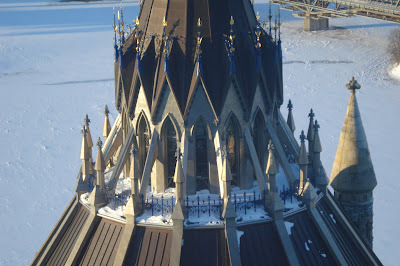 Looking north, we see the roof of the library, the Ottawa River, and the province of Quebec. The library is quite beautiful both within and also without as this closer shot of the roof might suggest. 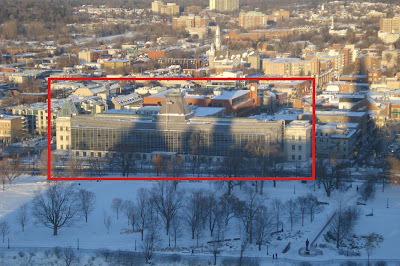 I thought some of my America friends might like to see the US embassy (outlined). I presume it's functional inside as it's not exactly stunning from the outside. Note the long shadows cast by the Parliament Buildings, due to low afternoon sun plus the fact these buildings are on a bit of a hill. 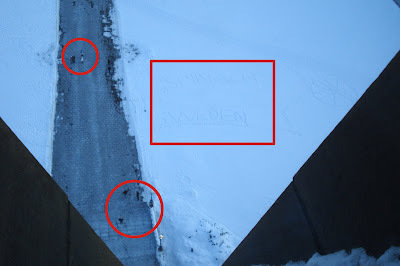 The next photo looks down on the south side where I've outlined the people in circles (for scale) and a snow message in the rectangle. If you click on the photo, you should be able to see the larger words, Spinach, and Sweden. Why? I have no idea. After our fine little outing, we headed back to the warmth and hospitality of Lorna and Dave's condo. We were treated to fine food, drink and fellowship. We played a game of Boggle after dinner, where Dave proved he was much smarter than the rest of us. In fact, he may have scored more points that we other three of us combined. 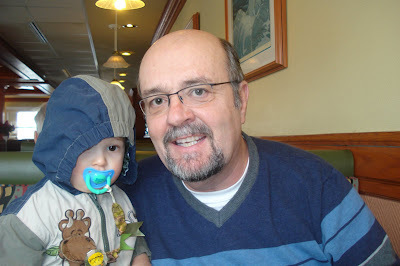 PS: This is Lorna's blog, and here is my post of our first meeting this past summer. 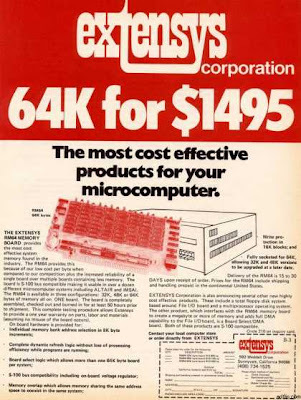 An ad from 1977: $1495 for 64k of RAM. 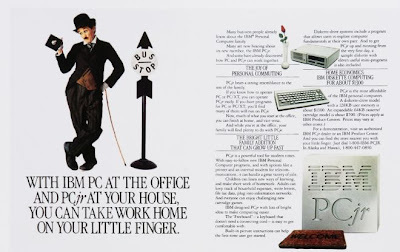 From the 80's: a PC Jr with 128k for ~$1300. My first machine, an Atari 800 with 48k of RAM, was purchased in the early 80's. It came with a cassette drive, and my monitor was an old TV. I remember that it took the cassette player 4 minutes to load a 16k game like Pac Man or Donkey Kong but I thought it was quite wonderful. Eventually, I was able to upgrade from the cassette by purchasing a single-sided, floppy disk drive for somewhere in the neighbourhood of $400 - $500 (the prices had come down to that). The great thing about that disk drive was that it included a printer port, which otherwise would have cost an additional $100 or so. I used that machine to learn how to word process and to work with spread sheets and used both in my teaching. Although we soon changed to photo copiers, schools were still using those old ditto machines back then, and I would run the masters through my trusty nine pin, dot matrix printer, which was also very expensive, and my days of writing my teaching aids by hand were history. I think my first MS-DOS machine (before Windows 3.1, which I later installed on it) had 4 megs of RAM and a hard drive of 100 megs and cost around $2000, probably in the early nineties. In retrospect, one of the funniest things, in a way, that I ever heard was said in our staff room several months after that purchase. A teacher had bought an even newer and more powerful machine and declared that he would never have to buy another computer. Apparently, he was quite wrong, and I didn't need to feel jealous. I pretty well knew how wrong he was at the time, but I confess to still feeling slight pangs of envy. The several computers that came after that one also cost in the neighbourhood of $2000. By comparison, my newest baby is a 64 bit machine with quad core processor, 8 gigs of RAM, a terabyte HD, a 22" monitor and costs a fair bit less than two grand. Unfortunately, in four years time, it too will be a clunker. It never rains but it pours, or so the saying goes. There have been a number of related expenses since upgrading to the new computer, the latest being a new scanner. I have an old, fairly decent one, but it doesn't talk to Windows 7 terribly well. Even then, on my old computer, it wasn't able to cope with most of my slides, which I would like to digitize. The majority of these, from the seventies, aren't in very good shape; they're quite dark, and the old scanner resisted working with them. I was gifted with a new little, dedicated slide scanner for Christmas. It worked, but I wasn't totally happy with it: neither the software not the results. So, yesterday, I returned it to Blacks and ended up at Henrys looking for a replacement. Somewhat surprisingly to me, I was pointed to flatbed scanners, and, even more surprisingly, I purchased one. I am finding that it will scan my slides, and although the results are problematic, I am usually able to salvage something. Like this one. 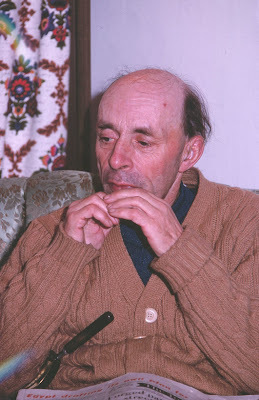 It's my dad, and I just used my fingers and toes to figure out that he in the picture and I at my computer right now are of a very similar age, probably within a year or at most two. But here's why I'm really posting this photo: the magnifying glass in his lap by the newspaper, the famous magnifying glass. For as long as I can remember this "glass" has been around. If I have my stories straight, my maternal grandmothers used it, so it's at least 60 years old. At least! In turn, both my parents used it. Not long before Mom passed on, she greatly amused us by proclaiming that she should get a new one because "They wear out, you know," for so it seemed that way to her dimming eyes. We still chuckle over her conclusion. Now, Cuppa and I find ourselves using it from time to time to read the fine print, particularly on medications. Just two days ago, I was straining to determine just how many decongestants I should take and how often. After much squinting, even with the magnifying glass, we believe that it's "one or two tablets every four hours to maximum of six per day." I think my magnifying glass is wearing out. Meanwhile, it's now being used to some degree by the fifth generation of Grandma and hr descendants as Nikki Dee is quite prone to latching onto it when she's visiting. 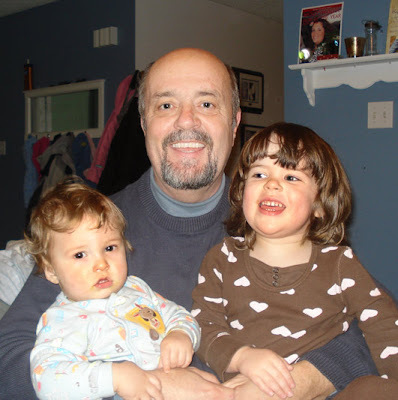 Looking at Buppa's enlarged facial features must work for her, however, as she hasn't complained that it's wearing out and needs to be replaced. Four o'clock and all is ... Well, well ... I don't know if it's exactly well. I mean it is four o'clock, and I am up, and I don't really wannabe. I slept lightly ... very lightly for a few hours ... in three different places: my reclining easy chair, the guest bed (which is now more like my bed), our bed, and back to the guest bed. Eventually, the waking, tossing and turning frustrates me, and I get up with a cuss word or two. I'm using Word. I always just type right in Blogger, but I'm using Word tonight (he's such a rebel). My word, my Word is new. Got the 2007 Home/Student version (with Excel, Powerpoint and OneNote, whatever the heck that is) on sale. Got it, so I might as well use it (he said fearing that if he had to type until he was sleepy, it might be a very long blog post -- a war and peace post, perhaps). Ifn's I stop now and find a spot to lay me 'ead, I wonders ifn I might sleep. Maybe I'll tri (which means try in one of my tri sleeping spots). 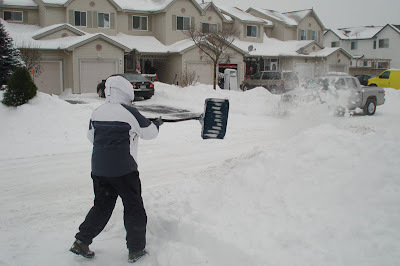 We have fairly long and cold winters here in the Ottawa region, so it's really best to make peace with that fact and embrace the weather as best one can. 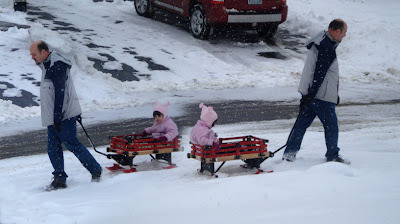 To that end, Cuppa and I gave the kids a sleigh for Christmas. Nikki Dee was the first, and so far the only grand, to try it out. 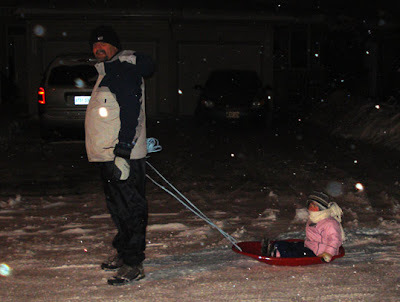 With Buppa as the horse and even attempting to sing Jingle Bells to the bonnie wee lass, out we went the other day. As the picture tells, Nikki Dee was quite content to ride whilst Buppa Horse pulled her back and forth and forth and back. As my bald pate might reveal, it was relatively warm on Friday, but yesterday and today were bitter, with the low temperatures being aided and abetted by a harsh, north wind. 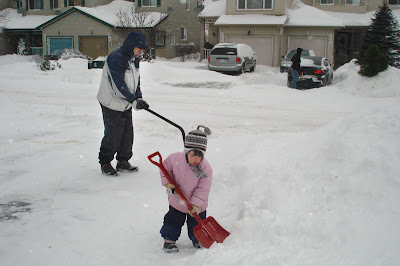 Nevertheless, we stopped by Canadian Tire to get her a little snow shovel so she could help Buppa clear the driveway. 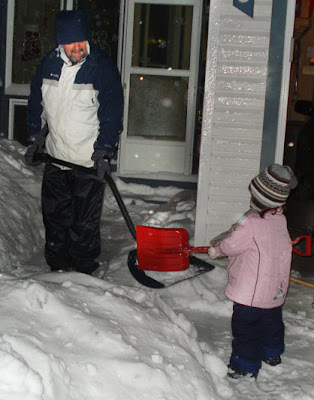 It was even colder when we finally got around to our shovelling in the evening, but we all bundled up and felt better for the outing. 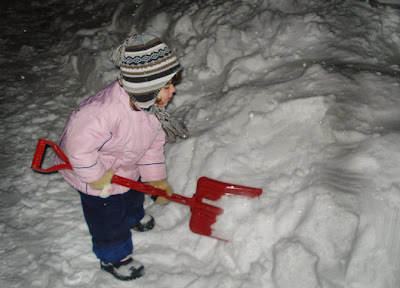 She didn't quite grasp the concept of shovelling onto the pile and not off the pile, but that's okay. 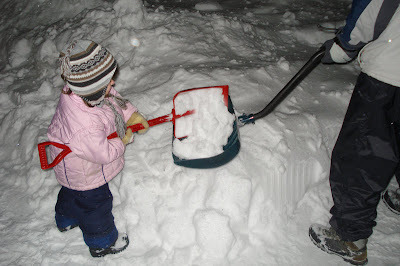 Then, she'd put some snow into my shovel and I'd fling it into the air to great cries of excitement. Cuppa took some dark an grainy video clips of our work session. 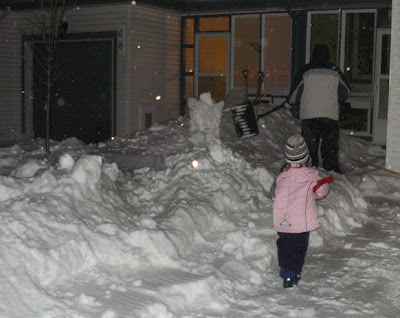 After shovelling, Buppa Horse was called back into action. We had a decent video clip that got lost somehow, so pictures will have to do. We had another frosty session this morning before lunch. The kid had got up at the unearthly hour of six o'clock and was tired but fought a morning attempt to have her nap. So, we decided that another session in the cold followed by lunch might do the trick. It did; she napped for an hour and a half after lunch. Cuppa got into the spirit of things too. 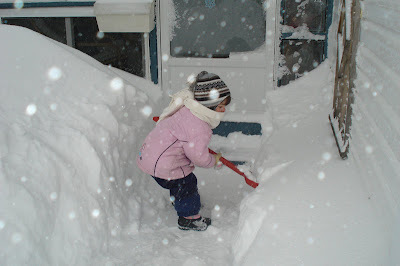 The lady can shovel it with the best of them, I tell ya. Update: Added Christmas Day slideshow. Silly Me! I am reading all sorts of you posting about New Years, and I'm still stuck on Christmas — not even Christmas really but the Eve thereof. Sheesh! You see, yesterday, I uploaded the final (for now) program, Photo Story that I wanted to install on my computer, and then I couldn't resist trying it out. I have been impressed by the slideshows of Explorer as well as others and, therefore, been inspired to improve my own output. I think Photo Story has helped me to do that. I've been aware of this free (for those running legitimate versions of Windows) program from Microsoft for some time, but decided not to burden my old computer with yet another program. Of no interest to anyone but family, here it is. Let's see if I can create a Christmas Day slideshow next.